Perfect catch emphasises a variety of strategies for keeping the ball off the ground, particularly overhead passing. 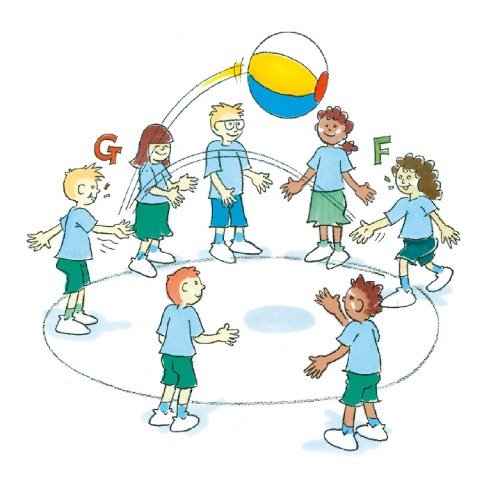 Play in groups of 6-8. Each player is given a letter; 1 player begins with the ball. The player throws the ball into the air and calls out another player’s letter. The player with that letter attempts to catch the ball while other players run away. If the ball is caught, the player immediately throws the ball into the air while calling out another letter. If the ball is dropped, the player fielding the ball calls ‘FREEZE’. The player with the ball has 1 turn to roll the ball at a frozen player. If the player doesn’t hit a frozen player, they throw the ball back in the air again and call out another letter. How could we throw the ball to make it harder for the fielders? Can we call something else other than a letter?